PALM BEACH, Fla. – March 24, 2016 – Barrett-Jackson, The World’s Greatest Collector Car Auctions®, will sell two cars from the personal collection of Hollywood megastar William Shatner during the company’s 14th Annual Palm Beach Auction from April 8-10, 2016, at the South Florida Fairgrounds. 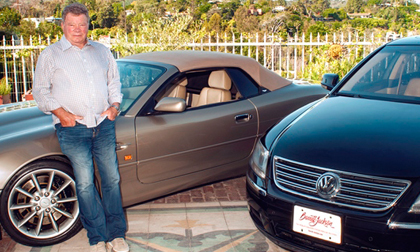 Shatner, best known as the original Captain James T. Kirk in the “Star Trek” TV and movie franchise, is selling a low-mileage 2002 Aston Martin DB7 Volante (Lot #89.1) and a 2004 Volkswagen Phaeton (Lot #89.2), both of which the star will autograph for the new owners during the auction. Shatner has long been a fan of everything automotive. Shortly after being cast as Captain Kirk in “Star Trek” in 1966, Shatner splurged on a Corvette Stingray. He has driven across the country numerous times in trucks, cars and even motorcycles. Just last year he drove from Chicago to Los Angeles along Route 66 for charity. “Mechanical things have always fascinated me,” said Shatner. “The sound of the exhaust, the ticking of the engine, the sleekness of the design have intrigued and entranced me. I look for cars like the ones I am selling: this great VW Phaeton – one of the most advanced cars in the world at its time – and this Aston Martin DB7, which is a jewel of design.